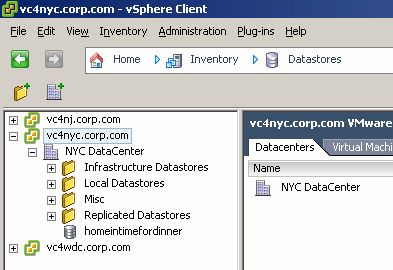 In this series of articles we will be looking at the new generation of VMware vSphere 4 plug-ins that make it increasingly easier to see your storage from with the vCenter/vSphere client. In addition you will learn how the NetApp Rapid Cloning Utility is not just a virtual machine (VM) copying tool, but also allows you to quickly and easily create and mount new data stores without needing access to the storage management tools. This is a must-read series for VMware admins who maintain and manage their own storage, and for storage admins who want to offload the burden of provisioning new storage to their VMware guys. If you are just joining us, please be sure to read the previous article in this series, Introducing NetApp Rapid Clone Utility 3.0. Now that we've completed the post-configuration steps, we're ready to play with the NetApp Rapid Clone Utility (RCU). Remember how I said in the preceding section that the RCU was so much more than just a tool for cloning VMs? The RCU can facilitate daily management. Here's how. Consider if you need to create a new volume because your VMware ESX hosts need a new chunk of storage; here's a 1,000-foot view of the steps you would have to take without the RCU. 1. Create a new volume. 2. Set up access (adding ESX hosts) and set the permissions. Now, let's compare that to using the RCU. 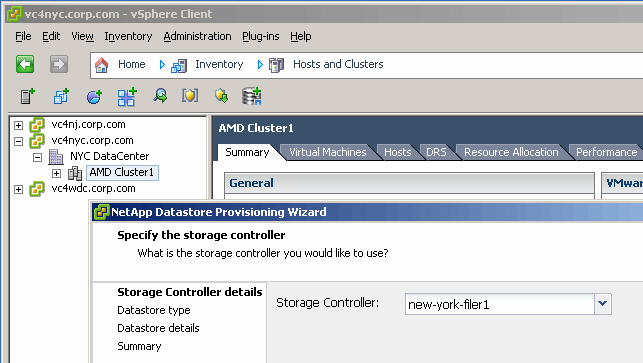 Select your VMware High Availability/Distrubuted Resource Scheduler cluster, and click the NetApp Datastore Provisioning Wizard icon. 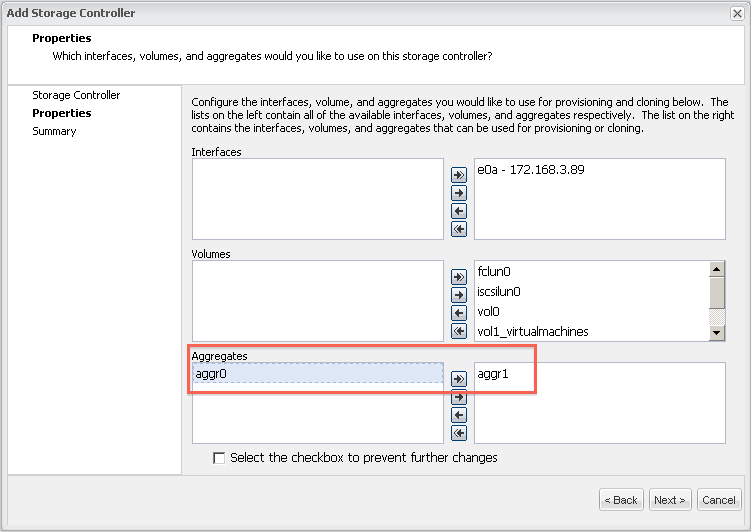 After clicking next, select either Network File System (NFS) or Virtual Machine File System (VMFS) as the volume. For the purposes of this article I selected NFS. The subsequent dialog is pretty straightforward. 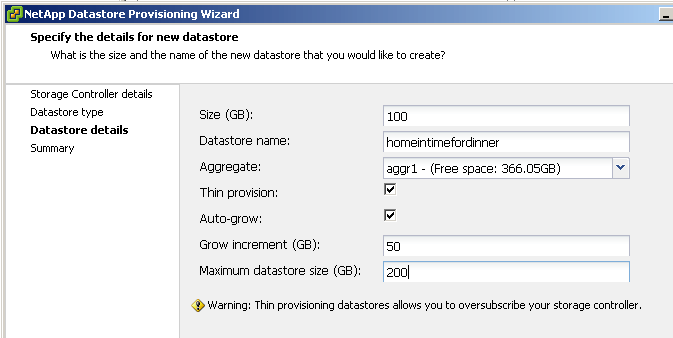 You specify a size (100 GB) and the datastore name. I called mine "homeintimefordinner" because that's my main goal. I was only able to select aggr1 because that's all that's allowed in the storage controllers configuration. What's really cute about the RCU is the access to additional parameters, such as thin-provisioning and auto-grow, allowing me to be really storage efficient while covering my you-know-what at the same time. This means that if, for example, my VMware admin puts more files in the volume than expected, he won't hit a brick wall. The volume will grow at a factor of 50 GB, until it hits the real wall of 200 GB. Click the Finish button and watch RCU take care of all the rest. And here's the important part -- it does this for every single ESX host in the cluster! Call up your favorite restaurant. As I'm British and it's a Friday, I decide it's got to be the timeless classic: fish and chips. 2. Ring up your partner, tell them you will be home early and you're "cooking." 3. Spend the weekend basking in newly-earned brownie points. 4. And that's two steps less than the manual method. How neat is that? As you can see there's more than meets the eye with the RCU. In the part in this series on NetApp vStorage plug-ins, I will be looking at the cloning process itself, and the VSC. Stay tuned.